Brewery • Low-alcohol line of beers, new location in Denver mark company's determination to move forward. Scott Sommerdorf | The Salt Lake Tribune Epic co-founder David Cole pours a "Santa Cruz Brown" on Thursday, Jan. 31, 2013, at the Epic brewery in Salt Lake City. Epic beers sells its freshly brewed and bottled beer on-site, as well as in state liquor stores and in restaurants and bars. It is one of 18 breweries in Utah, where many of the business are booming. Utah&apos;s restrictive liquor laws have led to two major changes for the Epic Brewing Company, known for its high-alcohol beer. First, the company is building a new $2 to $3 million brewery in Denver, where owners David Cole and Peter Erickson say the politics are more inviting to beer makers. And recently, Epic broke from its big beer mantra and added a line of low-alcohol  think 3.2  beer. The Unsacred Brewing line includes Priesthood Pale Ale, The Vision Lager, Unfaithful IPA and Rimando&apos;s Wit  named for Epic fan and Real Goalkeeper Nick Rimando. It&apos;s now showing up in Utah grocery stores and on tap in bars and restaurants. Ever since Epic opened three years ago, its full-strength beers have been available only in state-run liquor stores, at the brewery or in bottles at restaurants and bars because the alcohol content was higher than the 3.2 percent by weight  or 4 percent by volume allowed by state law. "I don&apos;t really like 3.2 beer. I think it lacks flavor [and] obviously it&apos;s not a lot of alcohol," said Cole. "The joke is it&apos;s an unsacred act of beer forced on us by the lawmakers because 3.2 beer is the only beer allowed to be on draft." Cole stopped drinking beer when he moved to Utah in the 1990s because the drinks were "so poor and thin." But he and Erickson decided to open their business after then-Gov. Jon Huntsman, Jr., championed changes through the Utah Legislature that eliminated private clubs and allowed breweries to sell full-strength beers from their locations, instead of only in state-run liquor stores. After Huntsman resigned to work in the Obama administration, state lawmakers have rolled back what Cole took for progress. "Who knows ... what things they&apos;ll dream up next to punish an industry that pays millions of millions of taxes in this state," Cole said. While he predicts state laws will eventually change, "It&apos;s going to change a lot slower than we are as a company." That&apos;s why Epic has turned to Denver, where it plans to open a 19,000-square-foot brewery in June or July to meet demand in the 12 states where Epic is sold. Unlike in Utah, the Denver-based brewery will open with a tap room and can serve drinks without selling food. Cole said the tax is lower, too. Having a tap room "is a great tourist model. 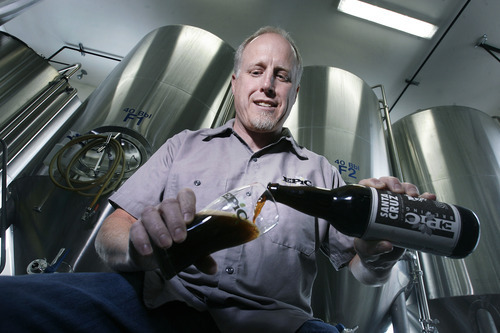 Colorado is becoming the Napa Valley of beer," he said. Epic&apos;s Utah brewery will remain open, Cole said, noting that the company expects to sell up to 13,000 barrels worth of beer in Utah this year, compared to 7,000 last year. Denver will have an initial capacity of 6,000 and can grow to 33,000. The popularity of craft beer is "part of that live local and know where the product you&apos;re putting in your body are coming from," he said to explain the growth.